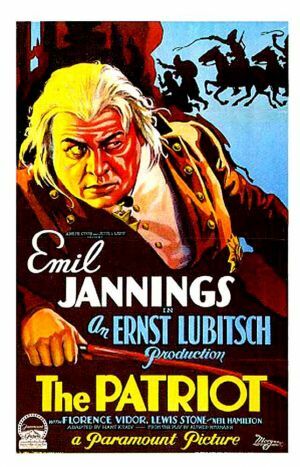 The Patriot is a 1928 silent historical drama directed by Ernst Lubitsch. The film stars Emil Jannings and Florence Vidor and is notable in that it's the only Best Picture nominee to be almost completely lost. The film is 113 minutes long and was adapted from two plays (Dmitry Merezhkovsky's Paul I and Ashley Dukes' The Patriot) to tell the story of a "mad king" opposed by his more sensible court, ultimately promoting the valor in patriotism over blind loyalty. Only fragments of the film have survived, and even less of it is available to the general public. About 2500 ft. of the film (roughly a quarter of the film's length) has been recovered and is preserved in the UCLA Film and Television Archive. Additionally, one reel of the film (from a total of 12 reels) was recovered in Portugal. Wikipedia article. Retrieved 04 Apr '16. ↑ Silent Era page. Retrieved 04 Apr '16.